Nature’s Sunshine REFUGE Calming Blend has notes of mellow floral, luscious citrus, and inviting vanilla which create a personal quiet space in any environment where calm is needed. 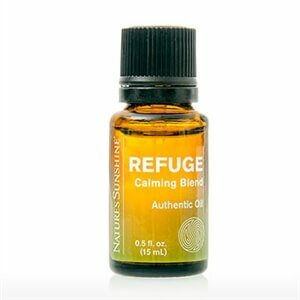 As daily stresses and worries accrue, REFUGE will be your beacon for peace and serenity. Use REFUGE as a perfect addition to a spa package. Refuge features a blend of lavender, orange, atlas cedar, ylang ylang, blue tansy, and vanilla.